Want a fun way to make use of your remaining 2015 PFD Coupons? Or do you have Gold Points you’re ready to redeem for roundtrip airfare? We’ve got you covered! It may seem like festivals and fairs only happy in Alaska from May to August. But there are actually plenty of goings on during the winter months, too. 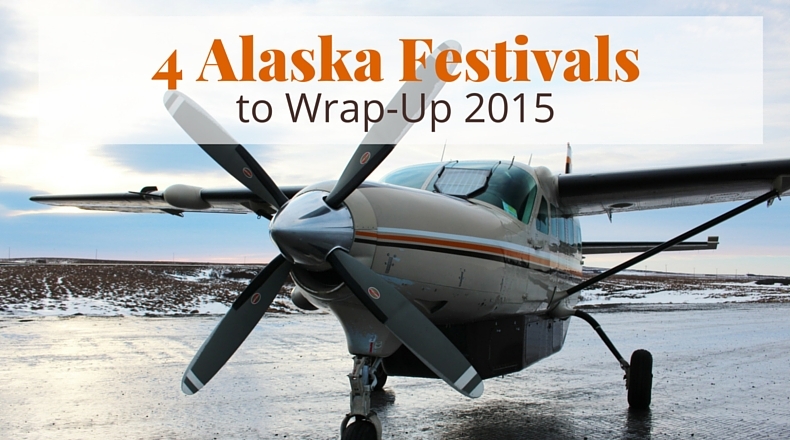 Here are four Alaska festivals you should check out before the year wraps up. Celebrate marine life and Alaska’s annual visitors – humpback whales – at the Sitka WhaleFest, now in its 19th year. This year’s theme is Life on the Boundary, which looks at the unique marine environment found along the ice and glaciers of our northern shores. Spend a long weekend at this three-day festival and symposium, where you’ll enjoy guest speakers, marine wildlife cruises and cultural activities. Event highlights include a 5K & 10K fun run/walk, the Marine Mingle banquet dinner, and Marine Art Classes. A mix of entertainment and education, this popular event is not to be missed! For a full list of happenings and other festival news, visit sitkawhalefest.org. Want to shop local this holiday season? Check out the Winter Arts Faire, where local artists and craftspeople gather to show off their talents and sell their unique creations. It’s easy to find something for everyone on your list, with pottery, jewelry, clothing, ornaments, specialty foods, original photography and so much more to choose from! Plus, there will be holiday fun and entertainment for the whole family. Stay warm with coffee, hot cocoa and pastries available on site. And keep your kids occupied as they explore the Imagination Station and craft room while you shop. They can even pay a visit to Santa and get in their special requests directly to the jolly fellow himself. Get the full scoop by visiting ketchikanarts.org. Looking for something fun to do with the family? Or for a fun way to jumpstart your holiday shopping? Round up the troops and head to the annual Seward Holiday Arts and Crafts Fair! Local and Southcentral artisans will be showcasing their works and wares at this annual event. Plus, you can enjoy tasty food, live entertainment, holiday music, a silent auction and photos with Santa Claus himself. Admission is free and open to all ages. The fair is sponsored by the Kenai Crewsers Rowing Club. For event updates, visit them online at kenaicrewsers.org. What better way to have fun during the dark month of December than by throwing a festival of lights? Hosted by the Bachelor Society, the Talkeetna Winterfest is kicked off with a Motorized Parade of Lights. Decorated floats and vehicles will cruise down Main St. as live Christmas music is broadcast along the parade route. Plus, you’ll catch a glimpse of Santa and Mrs. Clause in their sleigh! Other popular festival attractions include the Bachelor Society Ball and Auction and the Wilderness Woman Contest. All proceeds from these fundraising events are donated to charitable causes. For details and to purchase tickets, visit talkeetnabachelors.com. 2015 is almost over. Which festivals and fairs are on your list for these last couple of months? Tell us in the comments below!